Many of you who will read this will have seen Sasha at our rally day on 6th August 2006, she was the lovely old girl that I took into the ring to let you see what Rescue is all about. Sadly, Sasha passed away on Friday 11th August 2006. Sasha spent all her life on a puppy farm, she was bred from every season, locked away from everything and everyone - she didnt even know what grass was. When I was contacted to try and re-home her I had no problem in saying that the Samoyed Association Rescue would help this old girl to find a loving home where she could spend what was left of her life with someone who would love her and spoil her. This we did and on 10th January this year she was re-homed with a wonderful family, who took her into their home and showed her that not all people were bad. She was loved, spoiled and pampered. Sasha loved everyone and every day was a new beginning for her, she would go on her walks and see things that she had never known, people stopped to stroke her, other dogs said hello to her, she loved life, she loved people, why I will never know, after what kind of life she had previously. Sasha's spirit for life never left her and when she arrived at the Rally on 6th August, I couldnt believe that she had made it so far, but I knew that she didn't have long and my heart went out to the family who had given her 7 months of happiness. I cannot find the words to thank people like this family, who take on old and sick Samoyeds, knowing that it will not be long before they lose them. It is a hard time now for this family and a lot of tears have been shed, but they must always remember what they did for Sasha and I am sure with all my heart that Sasha is smiling down on them saying thanks. My thanks also must be added to all the people who take on our older Samoyeds for without you my work would be impossible. To me Rescue is re-homing a Samoyed regardless of age in the best possible home I can find. 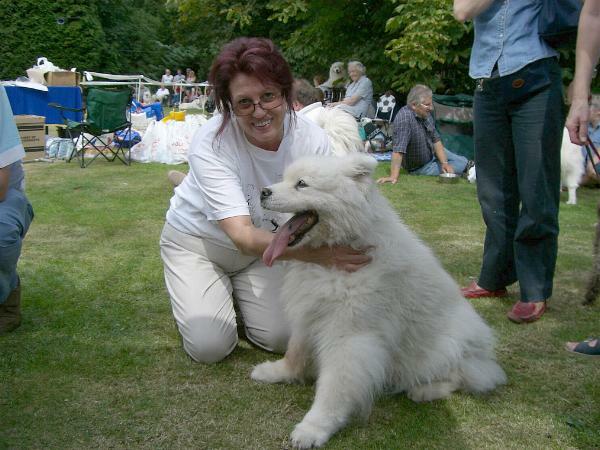 Can I remind people who are considering taking on a Rescue Samoyed that in general Samoyeds live to a good age, possibly 12 to 14 years old, so when you apply for a Rescue Samoyed and I say that I have only a 9 year old on our books, then you must realise that you could have at least 5 years with that dog. There was a telephone call, could we collect a 10 year old, male Samoyed from the M6 services at Lancaster; "just a short term foster". And there he was; a large, noisy, confused, sticky, evil smelling, toilet brush. He was terribly defensive; it took time and careful handling before he started to trust us. Grooming was a complete anathema to him. My carpets have never recovered from those first few days, while we were trying to clean him up and sort out his bowels!! Gradually we were captivated by this serious and troubled Samoyed and were hoping he would find that really special home he needed. However it became apparent that nobody suitable wanted this 10 year old boy. We couldn't and wouldn't turn our backs on him; so, he stayed. He's an absolute doll, loves being groomed, loves his walks; he's intelligent, loyal, obedient, loves people and is completely trustworthy with all dogs, big or small, male or female. The upheaval at this time in his life has taken its toll. His life is dominated by routine and familiarity; anything out of the ordinary and he starts to panic. Jazzie was never part of my Grand Plan; he's still a work in progress. He is an utterly guileless, frank individual with an enormous enthusiasm for life and doesn't deserve to be abandoned in his Veteran years. It is a privilege to share in his life. So, I sadly have to add; Jazzie was taken from us, shockingly unexpectedly, on Friday 20th June. He collapsed in the early evening: an inoperable massive tumor and internal bleeding. We had to let him go. We still cannot believe a dog could live with us for only 7 months and have such a massive impact on our lives. He was a true gentleman amongst dogs. He touched so many people. It's as if he always knew he was almost an angel. 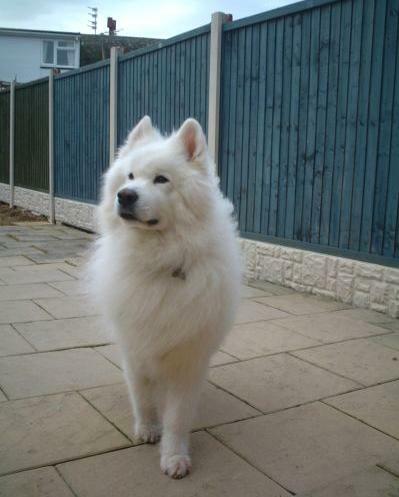 SAMMY - Is a 4/5 year old castrated male Samoyed. He is microchipped and up-to-date with his injections. Sammy has been in kennels for the last 3 months due to the fact that he had a large tumour on his back, near the end of his spine. The kennels have now had this removed and all is healing well, the tests show all is clear, although understandably he is still a little sensitive around that area. His coat was in a terrible mess but a groomer has now got him back into some sort of decent condition. He seems to get on well with other dogs, but he will need someone who knows the breed. This poor boy has had enough of kennel life and craves the comforts of a loving home with all the care and attention that he deserves. If you can give this boy the life he deserves please call one of the Rescue Officers. Unfortunately, Sammy's cancer has returned and he only has a short time to live. He will be not be open for re-homing. It is with a very heavy heart I put this on our Rescue page. This poor boy has never been loved or cared for the way a Samoyed should have been, abused, passed around with no love in his life. Sammy is going to come to live with me, my husband and Mum and, of course, my Samoyeds. Hopefully we can give him lots of love, care and a sense of belonging in his last weeks of life. Rescue thank the people who enquired about re-homing Sammy. It is with a very sad heart and lots of tears that I have to tell you we lost the battle to keep Sam going longer than expected. When we took Sam into our home and hearts we were told he had approximately 3 to 8 weeks to live. Unfortunately, yesterday, 31st January 2009, Sam lost his battle for life and was put to sleep to save him suffering anymore. I will give everyone that had enqired about Sam a full story on his life with us, but for legal reasons I cannot do it yet. Linda Brasier, Chief Rescue Officer.